Maintenance is the challenge for many people, but no material is maintenance-free, despite claims by PVC salesmen, as you will still get the staining eventually, which you can't clean off. But developments in timber window design and finish have created products that minimize water retention, damp penetration, and with micro-porous paints that allow wood to breathe; all contribute to a low maintenance product. Windows and doors supplied by Ranebrook Windows are delivered to site fully finished – coated, glazed and fitted with hardware in controlled factory conditions. They are designed and manufactured using the best available materials and techniques to produce high performance, low maintenance products with a long service life. But don’t forget, that maintenance a few times a year extends the lifetime of your windows and doors. We hope these guidelines will help to ensure the performance and good looks of your windows for their expected service life. Ventilation and heating should be provided as soon as possible after fitting, in order to bring the frames to their normal service conditions. Please note however that care must be taken to ensure that heating is only gradually brought up to the normal service level. Simple steps such as wiping down the joinery finish to remove dirt and insects will help extend the decorative finish. Care must be taken not to use products which could damage the surface coatings or the corrosion resistance of the hinges and other hardware. Clean weather seals and ventilators to remove dust or grime that can block the automatic water drainage and the natural ventilation around the frame. The windows must be reviewed once a year with a brush to make repairs to the surface wherever it is needed. Just one crack in the paint exposes the timber to moisture, and the decomposition of the timber has begun. Peeling and blistering paint is a thing of the past. Factory-finished windows need not be repainted for up to 10 years. Thereafter, a 5 to 10-year painting cycle is the norm. For post-treatment, we recommended the use of a water-based paint with great covering power. Surfaces should be lightly abraded with a fine grade abrasive paper, washed down with a mild detergent solution and rinsed with clean water to remove dust, insects and other contaminants. Using a good quality, long-haired, synthetic brush, apply one or two coats of water-based opaque or translucent topcoat in the appropriate shade, colour and gloss level. Allow drying for four hours between coats. So, while it remains true that timber windows need some maintenance, modern high-performance windows make that maintenance exceptionally easy. 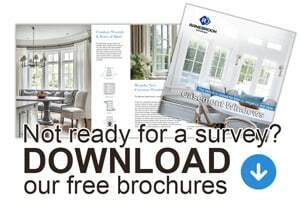 If you require more information, download our free 'Maintenance & Aftercare' brochure here.